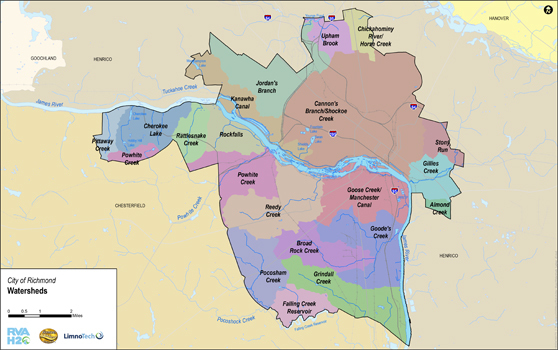 When it comes to Richmond’s watersheds, remember – every drop counts! A watershed is defined as an area that drains to a shared waterway, like a stream, lake or the ocean. Because these waterways are shared, the actions we take as individuals can directly impact water quality for many. Through best practices in watershed management, we can help to protect RVA’s water resources. You can use the map below to find the watershed closest to where you live and gain an understanding of how pollution in your area can easily impact water quality for those around you. To see more information on Virginia's watersheds, click here.